I have just finished Antony Beevor’s ‘Stalingrad’  and am still disturbed by the descriptions of almost universal cruelty on all sides. World War II cost the Red Army nearly 9 million dead and 18 million wounded. Only 1.8 million prisoners of war returned alive out of more than 4.5 million taken by the Wehrmacht. Russian civilian deaths are believed to be around 18 million, bringing the total war dead of the Soviet Union to over 26 million, more than five times the total of German war dead. At Stalingrad Germany and its allies lost an estimated half a million men. 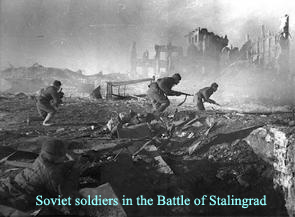 The Battle of Stalingrad lasted from August 21, 1942 to February 2, 1943. Stalingrad has gone down as one of the epic stories of resistance and human endurance. Hitler, obsessed by humiliating and destroying his former ally, Stalin, lost sight of his initial military objectives [securing the oilfields of the Caucasus] and ultimately lost the war through the loss of his Sixth Army. He lost the war because Russia’s sacrifices bled the Wehrmacht to death “far more surely than any western theatre” of war. Stalingrad roused left-wing sculptors, painters, novelists and poets, such as Pablo Neruda, who in his Nuevo Canto de Amor a Stalingrado wrote a poem of international love to a city whose name had brought hope to the world. This song of love for Stalingrad. The Soviet propaganda department played songs to depress and make homesick their enemy soldiers. They were advised by people like the German communist writer and poet Erich Weinert, who had been a member of the International Brigades in the Spanish Civil War, and the Hamburg-born socialist Willi Bredel who had been imprisoned by the Nazis in the 1930s, later fled, and published Die Prüfung (1934), a novel describing the Nazi concentration camps. However, one of the most poignant responses was the piece of art drawn by Dr Kurt Reuber, a Wehrmacht medical officer and pre-war Lutheran pastor. But I shall deal with that separately.